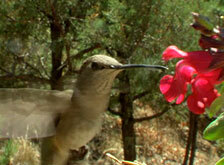 Hummingbirds: Magic in the Air - Contest: Can You Name Every Species? Hey, birders! Think you know your stuff? Watch the episode, then try to identify all 46 species pictured, and you could win a copy of Hummingbirds: Magic in the Air on DVD. The first person to identify them all — or the first person with the most correct responses by Friday, January 15, 2010 at 5:00pm ET — will be the winner. Please use either ALL common names or ALL Latin names to help us check your responses. Once we have a winner, we’ll post all of the species names and photos for your reference. Come on, give it your best shot! Congratulations to our winner, Ashley Hawrylyshyn, who named 36 out of 46 species correctly! Thanks to everyone who entered.